St. Patrick’s Day–you may not be Irish yourself, but I’m willing to bet you or someone you know acknowledges or celebrates March 17th. Our family (Felice and I) have Irish roots, so I personally celebrate, and I also enjoy traditional and authentic Irish foods, drinks, and art among other things. My favorite Irish bread is actually brown bread, but I cannot find a loaf of one to buy that I like, nor can I nail any recipe, no matter how “easy” and “fool-proof” I’m told it is. If you haven’t picked up on this about me, it’s that baking is a challenge. I love the exact science of it, but I hate terribly that, for some reason, my end result is never as it should be. Therefore I tend to cringe at the thought of it, but when I bake and it turns out great, it’s the BEST thing! So, because Irish Soda Bread is readily available for purchase as a loaf in a LOT of markets and bakeries in Chicago this time of year, I asked around in a mom’s group for their favorite place to get some. I personally have always thought that Jewel (big box grocery store) offered a great example of soda bread and several moms felt the same. Some other suggestions came though and I took note, went out to get a loaf from 3 places (okay, you guessed it, I sent Bob to do this errand) and had a tasting of all 3 loaves. Hard work (ahem). We had loaves from Jewel and Mariano’s (another big box store with a bakery), and Wolf’s Bakery in Evergreen Park, a southwest suburb of Chicago. I’m going to share what we thought, raisin by raisin, in the hopes of steering you to a great treat if you’re looking yourself. Also, since my little lass can’t enjoy traditional soda bread, I whipped up (see how I made myself sound all professional there?) 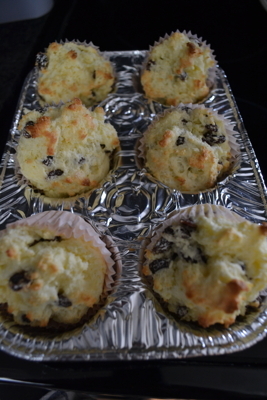 some gluten-free Irish Soda Bread muffins….she will never feel left out from culinary love due to gluten (or the lack thereof). I will share the link to the recipe I used and results of that as well. We cued up our favorite Saw Doctors playlist and dove in. As I first mentioned, Jewel was always my go-to for buying a pre-made loaf of soda bread. It didn’t disappoint this time, either. It was the most precisely-formed loaf of the 4: smooth and round, and also the darkest exterior. It came pre-sliced, which you’d think would dry the bread out more quickly, but it didn’t at all (and it keeps nicely for days). 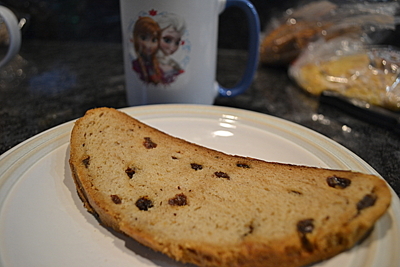 The bread has a good ratio of raisins-to-bread, as I don’t particularly like a raisin in every single bite. The texture was dense but not dry at all, and the traditional flavor stood out, even after I spread some softened butter on. A loaf from Jewel costs $2.69, the lowest price-point of the 3 loaves. Mariano’s bread came whole and not sliced, and it was the most crusty and hilly shaped. It also had crystal sugar coated on top. It wasn’t easy to cut a slice; the firm crust and the hand-packed shape made it difficult, but once I got the first section off, it was easier. 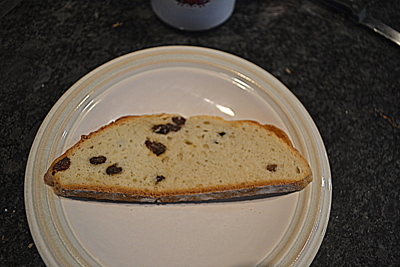 The bread was also dense in this sample, but much drier than Jewel’s; it actually crumbled apart before I could get a full slice to the plate. I was pleasantly surprised at the flavor, though, because I expected less from a dry bread: it was great. It had the perfect soda flavor, the right amount of raisins for me, and tasted the most like the bread I’d eaten in Ireland. I was just sad that it was so dry; maybe we didn’t get a fresh loaf. A loaf from Mariano’s costs $3.25. Wolf’s had signs in their bakery that touted their Irish Soda Bread as “Famous” so I had high hopes for this one, and I purposely tasted it last. It came sliced, slightly uneven on the top, with a medium-dark outer crust. The inside slices were creamy in color, but much lighter and less dense than the others (and than I’m used to). 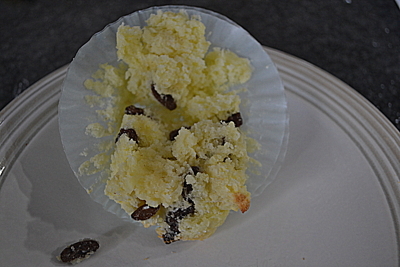 The raisins were sparse, and if I didn’t have a bite that had a raisin in it, the bread tasted like standard white bread. 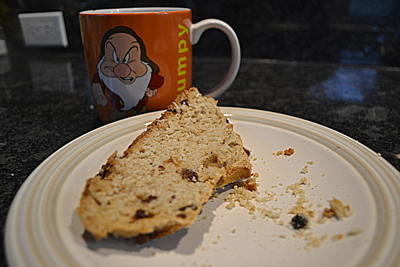 It wasn’t dry or crumbly, but it lacked any real flavor profile of soda bread. A loaf from Wolf’s Bakery costs $4.79. I think next year I’ll try different brands again, because it was not only a blast to eat soda bread all morning, but I have to admit that I love having so much of it on my kitchen counter. My hips, on the other hand, well, hips don’t lie. The best gluten-free Irish Soda Bread muffins, which actually rank #2 in my overall favorite bread samples, were super easy to make. They were packed with flavor and not at all dry. So, my vote was for Jewel as #1, gluten-free as #2, Mariano’s as #3 and Wolf’s as #4. Thanks for the inspiration! I’ve always wanted to try making gluten free soda bread and not known where to begin with the recipes out there. 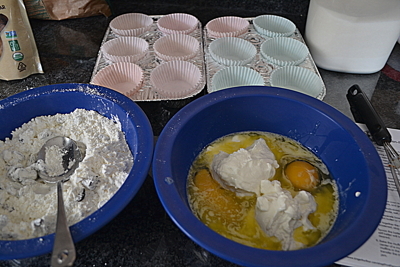 I think a homeschooling lesson in baking is just the thing we need to celebrate St. Patrick’s Day tomorrow. That’s a great idea and a really great compliment, Annie. Let me know how it turns out if you give it a go! …and now I’m hungry after reading this. Looks delicious!